By Chris Williams: Former heavyweight world title challenger Bryant Jennings will be facing 35-year-old Alexander Dimitrenko (41-3, 26 KOs) on August 18 at the Ocean Resort Casino in Atlantic City, New Jersey. Heavyweight prospect Joe Joyce (5-0, 5 KOs) had expressed interest in facing the 33-year-old Jennings, but his promoters at Top Rank reportedly weren’t interested in the Jennings-Joyce fight. Top Rank wants to get Jennings a title shot against IBF/WBA/WBO heavyweight champion Anthony Joshua. Jennings is ranked #8 by the World Boxing Organization. Putting Jennings in only safe fights against mediocre heavyweights like Dimitrenko will keep him on course for a title shot. Jennings wins easily against Dimitrenko. It’s too bad Top Rank isn’t interested in matching Jennings against a good fighter instead of a lower level opponent, but I guess there’s some concerns whether he can handle the talented heavyweights or even a prospect like Joyce. I think Joyce would KO Jennings without any problems. Top Rank signed Jennings a couple of years ago in order to try and rebuild him for a title shot. If they can get Jennings a shot at a title against Anthony Joshua, he’ll bring in some good money to the promotional company but he obviously won’t win. Joshua will likely destroy Jennings in three rounds or less. I doubt that Jennings will still be with Top Rank after that, because keeping him around for another rebuild will likely take way too long for it to be worth it. Dimitrenko looked awful in losing to Joseph Parker by a 3rd round knockout in 2016. Some boxing fans thought Dimitrenko caved in too easily in that fight, as he didn’t take much punishment before he collapsed to the canvas in the third round. Dimitrenko didn’t look like he wanted to fight hard. Since that fight, Dimitrenko has won his last three fights beating Adrian Granat, Miljan Rovcanin and Milos Dovedan. Dimitrenko didn’t look good beating Rovcanin by a 10 round disqualification last December. It looked like Rovcanin had done enough to win the fight, but he lost by a DQ due to hi being deducted points on three occasions. Dimitrenko looked horrible against a guy that isn’t a top tier opponent. Without the point deductions, Dimitrenko would have lost the match. Top Rank can find a MUCH better opponent for Jennings than Dimitrenko, but it appears they’re more interested in feeding him a fodder opponent to keep him from losing again. It’s been three years since Jennings lost to Luis ‘King Kong’ Ortiz and Wladimir Klitschko. Jennings hasn’t fought anyone good since then. Jennings took two years off from boxing after his losses to Ortiz and Klitschko Jennings came back last year and has defeated Daniel Martz, Don Haynesworth, Akhror Muralimov and Joey Dawejko. 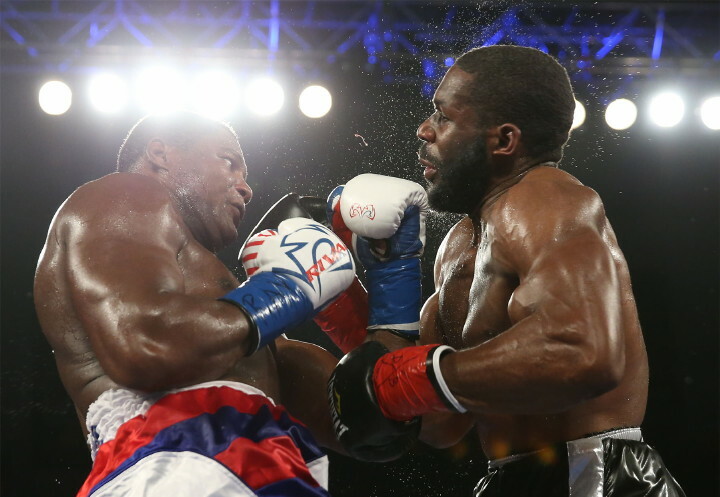 Jennings struggled in beating Dawejko by a 10 round unanimous decision last April. That was not an easy fight for Jennings despite the judges giving him a wide decision.